Another frozen yogurt store in Menlo Park? 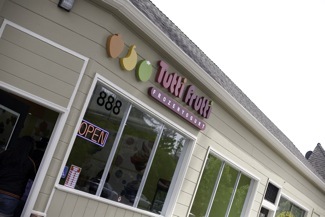 Yes, but the just-opened Tutti Frutti on Willow Road at Chester is the only one east of El Camino – and it brings a familiar face back to the neighborhood. The shop’s owner, Johnny Ajluni, grew up working at his father’s All American market (now the El Rancho) just a few doors down from Tutti Frutti. Why come back? While Tutti Frutti is a franchise operation, Johnny picked which colors would go on which walls and worked on the some of the store’s renovations from its previous occupant. The self serve yogurt he sells comes in both tart and creamy flavors with a variety of toppings. On its first weekend opened, the place was jam-packed with locals and Johnny is looking forward to the upcoming three day weekend. “It’s great to be back in Menlo Park,” he said.